Annual operating season from Victoria Day weekend to October Thanksgiving day weekend. The Sunday of the "May Long" weekend marks the annual opening to the public of the next running season. Bring your family. Bring your friends. Come and experience an interpretive journey on the 1.6 km of track which is currently operational. We are open to the public every Sunday between 11:00AM and 4:00PM, weather permitting, until the Canadian Thanksgiving weekend in October. Unfortunately the park is NOT open to the public on Saturdays or weekdays except for special events as detailed below. Admission to the park is free. The cost of journeys is $3.00 each. Ticket Bundles of 8/$20.00 and 25/$50.00 are also available. Cash Only please as we are not equipped to accept debit or credit cards. Children under 3 years of age ride for free but must be accompanied by an adult. Also note that private events can be booked on Sundays. See the "Birthday/Events" tab above for details. In addition to being open "every Sunday, we are also open on the following "special" days. 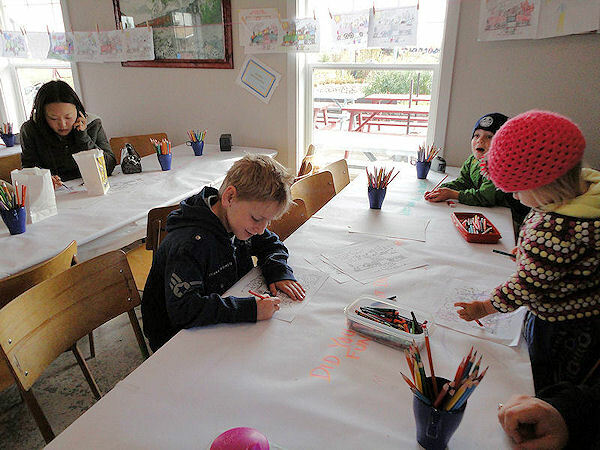 Drawing and Coloring for young and old was one of many special activities which took place at ARTember 2011 and 2012.